The Export Processing Zones (EPZs) across the country fetched 20 percent of the total national Foreign Direct Investment (FDI) during the last fiscal. The EPZs brought $404.36 million while FDI of the country in the 2014-15 fiscal was US$ 2015.20 million, says a BEPZA press release. BEPZA is contributing to the total economy of Bangladesh from the eight EPZs over a land of 2307.27 acres. According to Annual Performance Agreement (APA), the Bangladesh Export Processing Zones Authority (BEPZA) exceeded the investment target by $66.36 million against the target of $338 million for 2015-16 fiscal year. 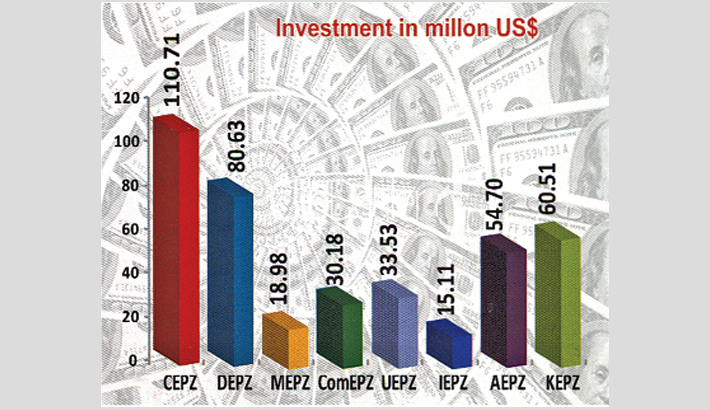 $404.36 million has been invested in the enterprises of eight EPZs under BEPZA during July-2015 to June-2016. In 2015-16 fiscal, $110.71 million investment has been made at Chittagong EPZ, $80.63 million at Dhaka EPZ, $60.51 at Karnaphuli EPZ, $54.70 million at Adamjee EPZ, $30.18 million at Comilla EPZ, $18.98 million at Mongla EPZ, $15.11 million at Ishwardi EPZ and $33.53 million at Uttara EPZ. It may be mentioned that, BEPZA signed investment agreement with 16 new companies in the last fiscal year. These companies will invest $167.56 million for setting up their industrial units.